I began taking guitar lessons at the age of 11 with blues/jazz guitarist Tom Castonzo, a frequent performer, bandleader and teacher in and around the Chicago area. My studies with Tom lasted for many years and covered various musical and technical aspects of many different styles ranging from jazz to classical and everything in between. In 2002, I began performing in pit orchestras for various musicals including Jesus Christ Superstar, Les Miserable, The Wiz, Little Shop of Horrors, and Seussical the Musical. From 2003-2008, I wrote and performed music for 2 different progressive rock bands: Dream Haven and The Unit Theory. Dream Haven released the EP entitled “Nostalgia is Five Frame” and The Unit Theory released a full-length album entitled “Seed.” Both bands performed all over the greater Chicago-land area and helped me hone my skills as an electric guitarist. Throughout this time, we shared the stage with national touring & recording acts Fear Factory, Mastodon, Enuff Z’nuff, and Algernon, to name a few. I now play lead guitar in the Chicago-based alternative rock band Davenport Ed and am having started an all-instrumental acoustic/rock trio with two percussionists. After high school, I attended the College of Dupage (COD) and began studying jazz guitar with Dr. Zvonimir Tot. Towards the end of my studies at COD, I developed an interest in classical guitar and took lessons from Steve Ramsdell. After I received my Associate’s Degree in Music from COD I started teaching private guitar lessons at various suburban Chicagoland locations. I graduated from COD in 2004 with an Associate in Music degree. In the fall of 2005, I started my Bachelor’s studies in Classical Guitar Performance at Northern Illinois University (NIU) with Fareed Haque (Winner of “Best World Guitarist” in Guitar Magazine). While at NIU, I continued to teach & perform up until I graduated in May 2008 with a Bachelor’s degree in Classical Guitar Performance. I started my graduate studies in August 2008 at the New England Conservatory of Music (NEC) in Boston, under the tutelage of world-renowned guitarist Eliot Fisk. 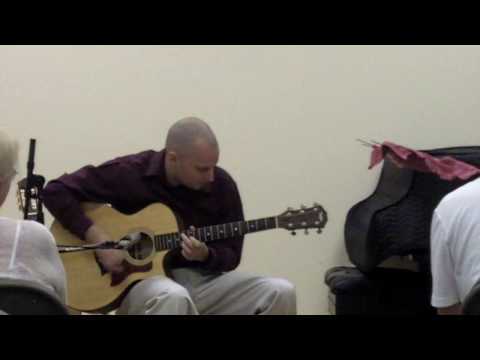 As an active performer in the greater Boston area, I made it a goal to bring the classical guitar to unorthodox venues such as senior centers, local TV, hospitals, dialysis treatment centers, and even juvenile halls! While at NEC, I started to take an interest in transcription, which is the art of adapting a composition for a voice or instrument other than the original. Eliot Fisk is a master at this, and his guidance was profound. 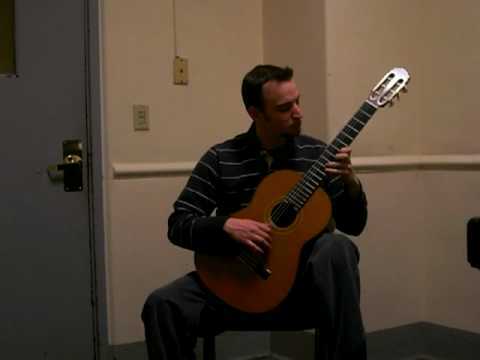 In June 2010, I graduated from NEC with a Master’s in Music (with Academic Honors) for Classical Guitar Performance. My master's recital was a tour-de-force of virtuosic classical, acoustic, and electric guitar pieces with music ranging from J.S. Bach to Joaquin Rodrigo to Steve Vai. During my time at NEC, I was fortunate enough to meet Grisha Goryachev, a master flamenco guitarist. Grisha introduced me to the basic principals of flamenco guitar and proved to be a wonderful resource. I continue my flamenco guitar studies by learning historical flamenco recordings entirely by ear. Short of living in Spain for extended periods of time, I have found this to be the purest way of learning. I am now the flamenco guitarist for Ritmo Flamenco, an ensemble that features dancer Diane Campbell. I moved back to Chicago in July 2010 and have since had hundreds of performances that include weddings, corporate events, restaurants, recitals, and more. My reputation as a premiere performing guitarist has grown rapidly in the past 2 years, and I earned 2 awards at the end of 2012: “Top Solo Guitarist” on the world’s largest entertainment site which is Gig Master and “Best of Wedding” (the world’s largest wedding-planning site). I am a regular featured performing artist at premiere restaurants in the Chicago suburbs including The Cellar Bistro in Wheaton, Eddie Merlot’s in Warrenville, and Wildwood Steakhouse in Geneva. Music stands, guitars (acoustic, electric, classical), cable/amp, appropriate paper materials & books for learning music. I do not travel to lessons. I specialize in classical, rock, pop, & music theory. I perform & teach guitar full-time as of June 2010. As a performer, have won multiple awards* for my performances at weddings & private events. I have been teaching guitar since June 2002 & have twice been named Takelessons.com's "Teacher of the Week". 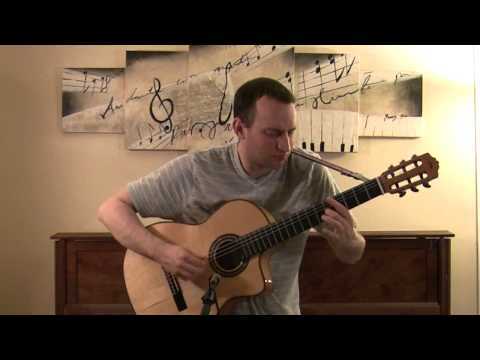 Jim Perona plays Carcassi's "Etude 25" on classical guitar. Jim Perona is a graduate student at the New England Conservatory of Music, currently studying with world-renowned guitarist Eliot Fisk. 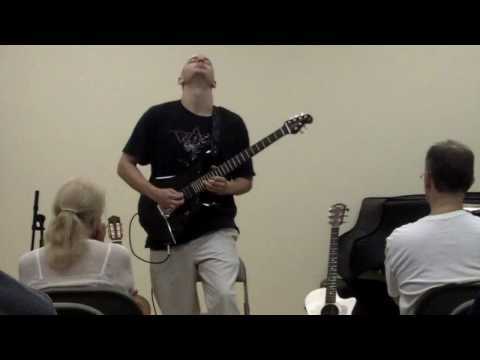 Takelessons.com instructor Jim Perona performs Steve Vai's "For the Love of God"
Jim Perona (guitar), Dave Joseph (percussion), & Ryan Romanelli (percussion) perform "Midnight Express" by Nuno Bettencourt. 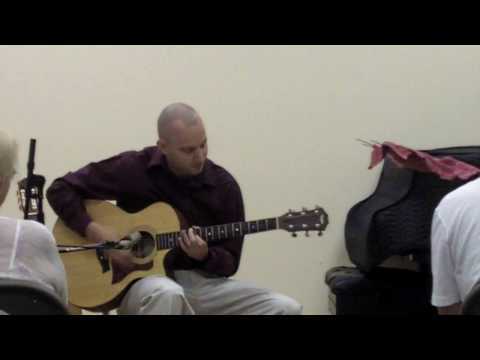 Introducing Jim Perona, a guitar instructor for www.takelessons.com. Have been teaching myself guitar for two years; Jim has shown me I'm ready to move up a level. His lessons (I've had three so far) are fun and he tailors them to what I want to play. Jim provides written notes summarizing the lesson and guiding my practice for the next week. And he plays guitar beautifully. Makes me hope to be good myself someday. James is a great teacher able to break down complex music and communicate how to play it. Jim is a great instructor, and a great guy. I feel like I am making good progress after only 5 weeks. Jim teaches my daughter guitar. He is her fourth guitar teacher and by far the best one of all. She has had lessons from him for the past two years. Besides talent, he has the schooling to back him up. She has learned a lot from Jim, and he truly listens to her input. It's amazing how good he is and how good my daughter has become. Jim is also very patient, positive and motivating. I contacted Jim through TakeLessons because I saw that he had the best reviews on the site and he is not far from where I live. I came to him as a beginner guitarist, with my only experience being teaching myself some basic stuff with the aid of YouTube. Jim started out by first figuring out what my goals were in playing guitar so that he could take the most suitable approach in teaching me. At our first lesson, he had me play what I could and he gave me advice on all the fundamentals that are really important. He even noticed that I had an unorthodox way of making a G chord and gave me tips on the proper way to position my fretting hand so that, decades down the road, I do not run into trouble with pain and that sort of thing. Whheeeeeewwwww. Good save there. Jim is very good at seeing the big picture in context with your goals as a student and delivering the lesson accordingly. He takes notes and emails them to you after the lesson, which is very nice to have. He makes videos during the lesson and then sends you a link to the video so that you can watch it a million times if you need. He does his best to accommodate your schedule if anything comes up and you have to reschedule, which I have done several times. Jim is easy-going and has a good sense of humor, which makes the lesson more enjoyable. In addition, Jim also performs very often in the local area and one time I was fortunate enough to see him perform in his band. His guitar solo gave me chills in my spine. This might seem off-topic, but it's not, because the reason I bring it up is because I was inspired to want to play more often and learn more because I see my guitar teacher rocking the stage and who doesn't want to do that, and also if you're going to pay for something, don't you want to make sure you're getting the best product out there? Jim is a true professional and boy can he play. Please excuse the run-on sentence. I'm leaving this review because I'm moving and I just had my last lesson with Jim and the money I invested was money well spent. 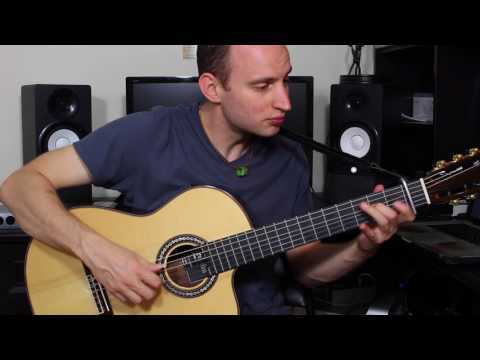 I have been learning acoustic and classical guitar from James for more than 2 years now. His technique of teaching, the motivation, tips and videos he provides are simply exceptional. I would surely recommend him for anyone interested. James is totally inspiring and bringing out the best in my son! His music has improved dramatically and he loves taking lessons from him. He is an extremely patient teacher. Pushes you in the right direction, in the right amount. James is an awesome teacher. He is extremely patient, knowledgeable, and answers every questions. Good stuff. Learnin' a lot. Excited to learn more. Jim is extremely patient and clear with my 7 y/o son and me. Although I really enjoy his interest in classic spanish guitar (my interest), he offers a diverse repetoire teaching my son awesome rock riffs on the electric guitar.